How to Make Your Own Woodworking Hand Planes. Follow along as Rob Stoakley designs and makes a wooden plane. How to Build a Handsaw Rack. 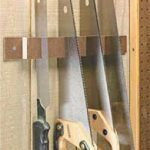 This simple wall storage rack keeps the saws out of the way but still easily accessible. When it comes to building a big project like this classic oak tool cabinet, it can be a little intimidating. So I find it is helpful to step back and break it down into sections so you don not get overwhelmed by the details. That is what I did here. The tool cabinet is made up of four different elements: the case, doors, drawers, and trays. The cutting diagrams and materials list are available to download in this Online Extra. Free Shop Plans to Make Shop Built Texturing Spiraling Tools. Here are some pictures of my latest shop built tool. It is based upon the Sorby Texturing/Spiraling tool that sells for around 130.00 to 156.00. This shop built version cost me approximately 26.00 in materials, and about 2 hours to build.